Do you feel like you have to shave every time you hop in the shower? Why not try laser hair removal? This is the exciting time of year when Winter is behind us and the beach is on our minds. Why not treat yourself by ditching that 2018 razor routine? Laser hair removal is quickly becoming the go-to solution for unwanted hair on many parts of the body. At Fountain of Youth here on the Eastern Shore is quick, easy, virtually painless and far beats the overall costs of that razor and shaving cream. Get beach and boat ready for our beautiful Spring weather here on the Eastern Shore with laser hair removal that is quick, effective and pain-free. Why Try Laser Hair Removal? Laser hair removal is a wonderful switch from traditional shaving. Here is how it works: At Fountain of Youth, we use a high beamed laser that specifically targets the follicle. This light targets the follicle destroying the hair and best of all, eliminates growth. Because this process is so targeted, there is no damage to the surrounding area of skin or hair. Our Quanta Laser is perfect for any area of the body including face, underarms, legs and bikini area. Fountain of Youth is so quick, you will be in and out in about 30 minutes. We understand you live an active lifestyle and we aim to provide the highest quality services that don’t hold you up. Our laser hair removal system targets the hair follicle for immediate results you can show off! Not only do you see the results quickly but it’ll have a long-lasting effect with continued treatments. 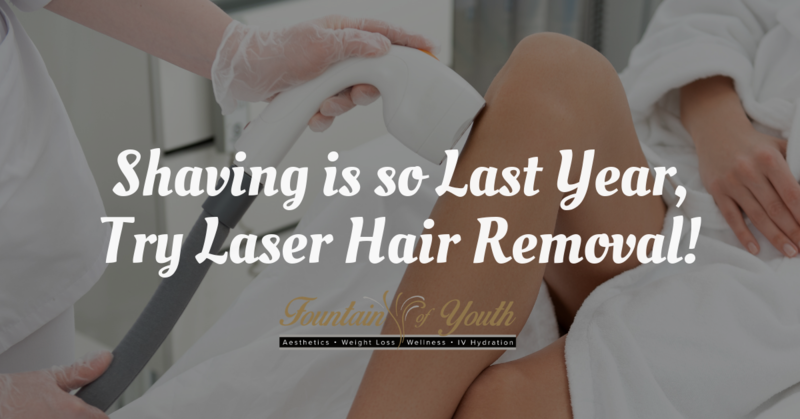 If you have had other types of laser hair removal, then you know one of the biggest hassles is waiting for hair to regrow before your next treatment. No need to do this with our system! Our laser hair removal technique uses high beam light that removes the hair right away, with no need for complete regrowth before you need a touch-up. In short, we use a system that fits today’s busy lifestyle of our clients. The costs of expensive razors and shaving creams and supplies really add up! Over the course of 5 or 10 years, it is safe to say thousands of dollars are spent. With lackluster results. Laser hair removal at Fountain of Youth is an up-front reasonable investment that pays off in the long run. Think of the time you will save. Along with the money! It is easy to see that making the investment in our high beam laser hair removal is a smart financial move. Why wait? You can have your underarms, face, legs and bikini area ready for the boat, beach or water park in under 30 minutes. And say so long to the shaving supplies! Wouldn’t it be nice to rest easy knowing that with one short session your unwanted hair is gone for weeks or months? Life is meant to enjoy, not spent shaving unwanted hair. Our results will leave your skin smooth, soft, hair-free and without those pesky cuts, razors leave behind.